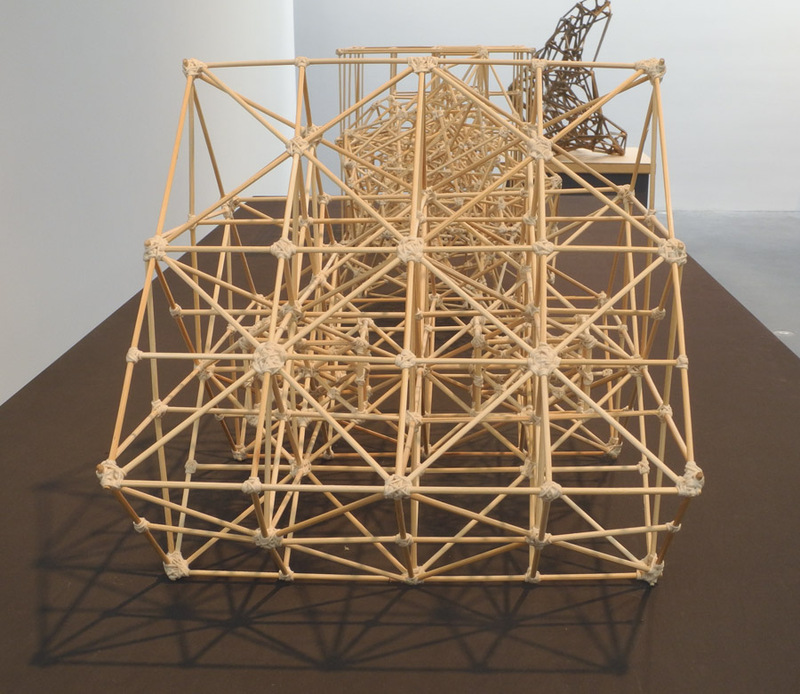 Freeman Dyson, 2014; bamboo, string, and glue; 20 1/2 x 7 1/4 x 21 1/4 in. 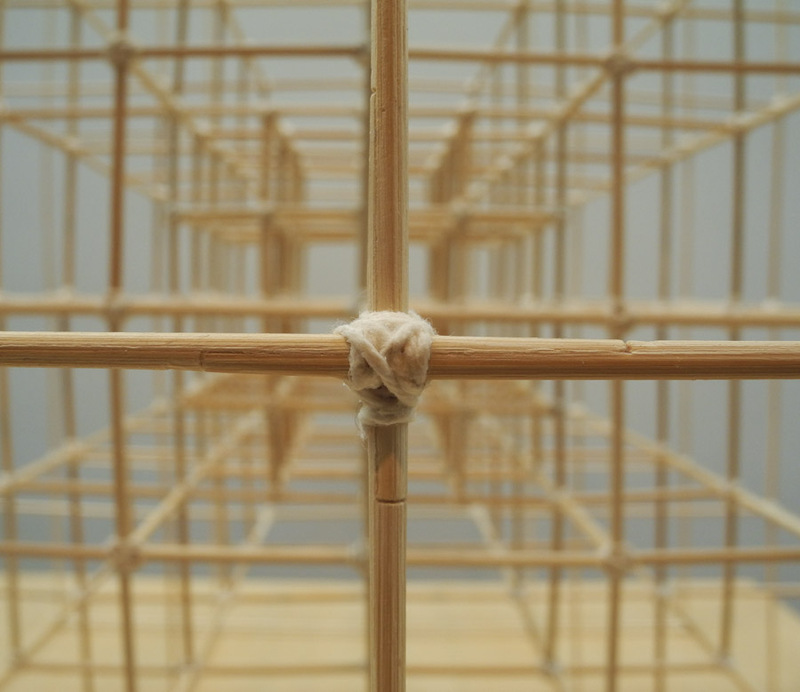 I love seeing everyday materials––in this case toothpicks, bamboo skewers, string––transformed into art. It is a reminder that art making does not have to be a grand and exalted process, but can be one of imagination and invention, couched in everyday-ness. 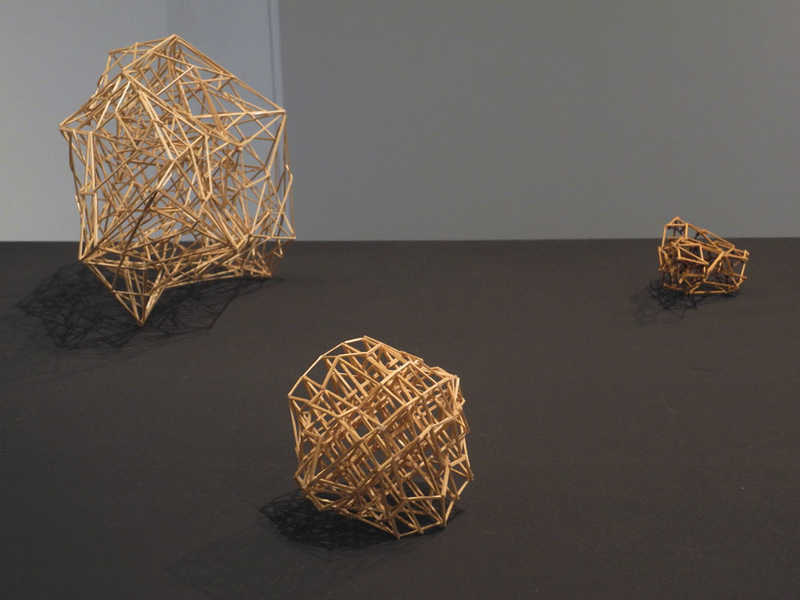 In his show at Pace Gallery, James Siena presents small marvels of sculpture made of thin sticks of wood, held together by glue and string. The gridded forms are complex and varied, and in that way are similar to the paintings and drawings that he's been making for many years. 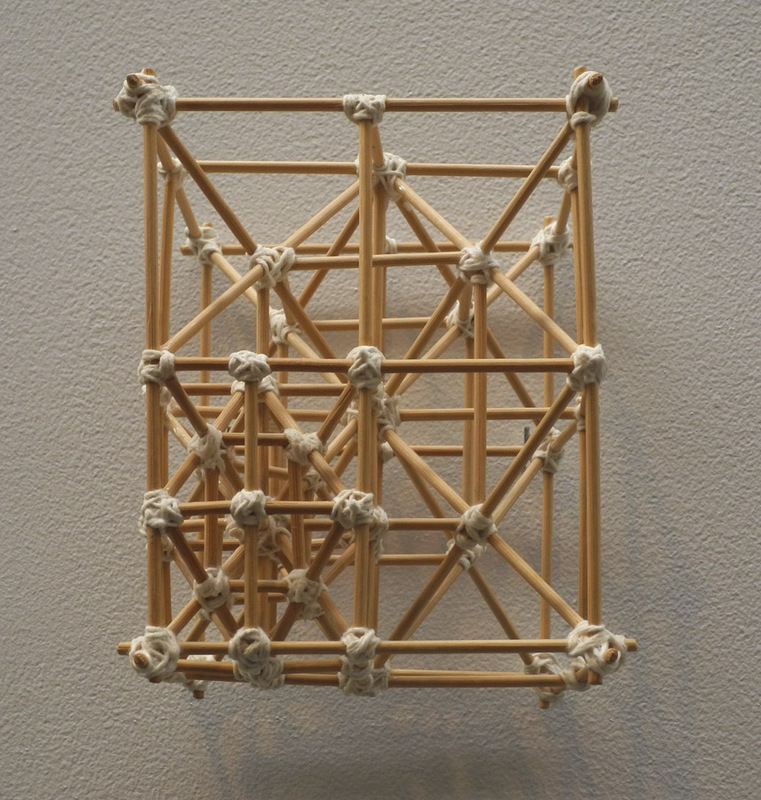 Richard Feynman, 2014; bamboo, string, and glue; 21 1/2 x 21 x 21 in. There is order of a very personal sort, a measured regularity that is lightened by the wavering lines of bamboo. The structure of some of these sculptures reminded me of the space in Giacometti's The Palace at 4 a.m., though without any of the surreal elements. I do feel that I want to wander into Siena's spaces to try to decipher them. To me, the simple wrapping of string to hold crossing sticks together emphasizes the handmade, the artist's close attention to detail, and in its fragility is very touching. 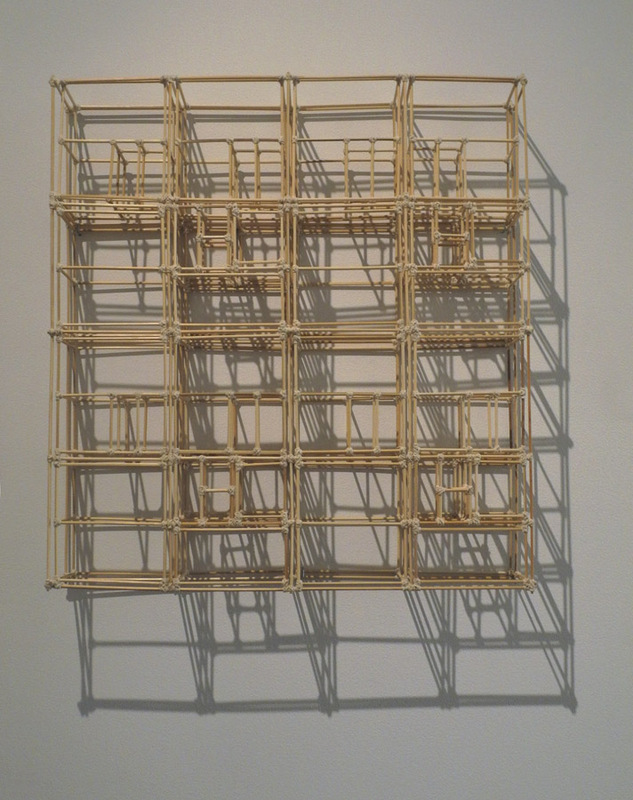 Barbara Tuchman, 2014; bamboo, string, and glue; 21 1/2 x 21 x 3 3/4 in. I love that Siena has titled his pieces using the names of (mostly) famous people, scientists as in the case of Richard Feynman and Freeman Dyson, or writer and historian for Barbara Tuchman; it's a wonderful way to pay homage to their work. Barbara Tuchman has spaces that feel very architectural, as though this is a model of the interior of a building, with divisions and subdivisions. 5 3/4 x 5 3/4 in. In this dense little piece, the tight rounds of string become prominent: points marking a journey, stars in constellations. The title––which I hope is correct since my documentation isn't perfect––is one of the more rare metaphoric ones, and it's very funny. 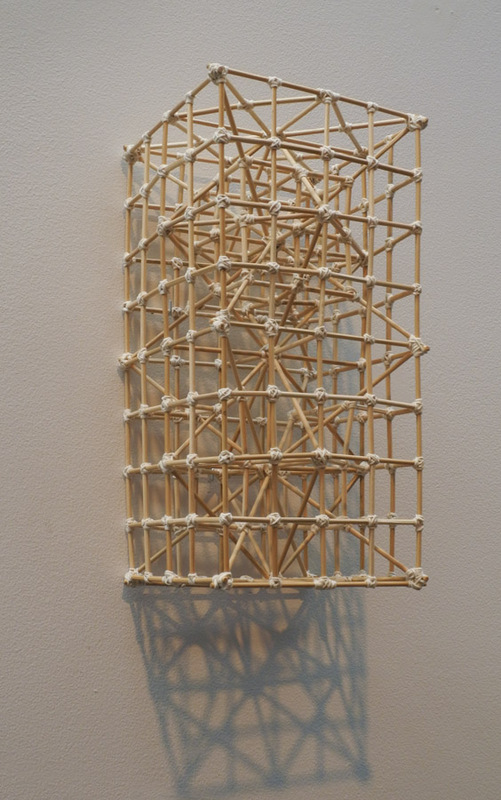 Katherine Dalsimer, 2013; bamboo, string, and glue; 5 3/4 x 4 3/4 x 5 in. Katherine Dalsimer (who by the way is a psychologist and author who wrote a book on Virginia Woolf [I had to look that up]) is another very small piece which makes us very aware of the joining of elements; their tightly bound crossings are poignant, as though overcoming the natural desire of things to pull apart. 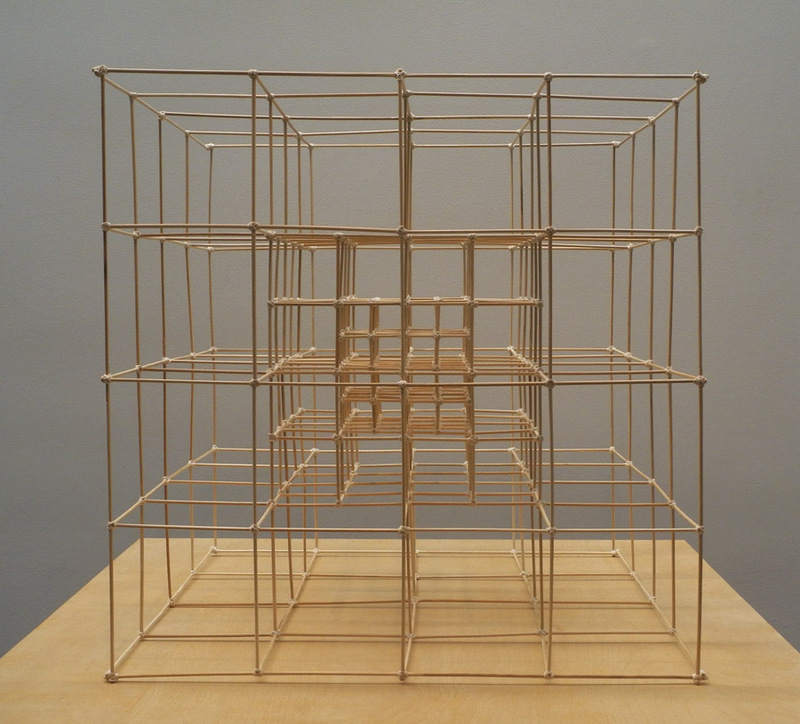 Dorothy Vogel, 2013-14; toothpicks and glue; 3 x 5 1/4 x 4 1/2 in. 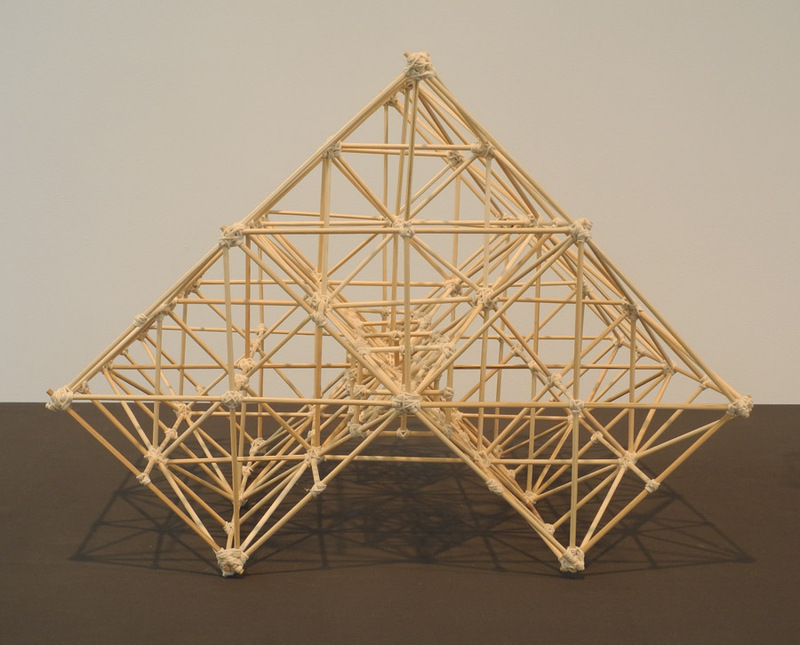 Anthony Braxton, 2013; toothpicks and glue; 2 3/4 x 3 x 3 1/4 in. 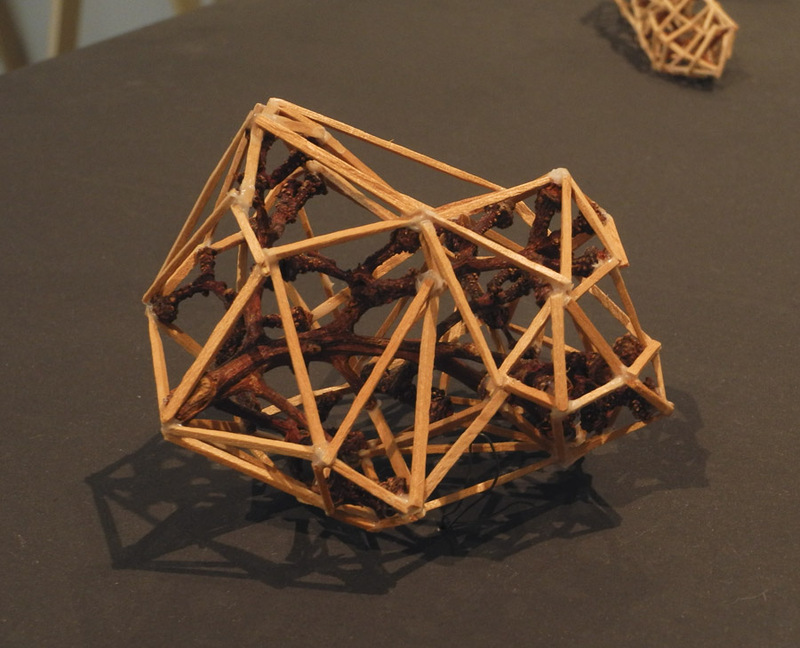 Terrance McKenna, 2007; grape stems, toothpicks, and glue; 2 1/4 x 2 1/2 x 3 1/2 in. There were several tables in the exhibition on which were very small pieces, whose structures were dense and irregular; they were like little explosions of line, full of vibrant energy. In some of the small pieces bits of grape stems or wood are embedded within the toothpick structure, as though captured. This early piece leads me to imagine how Siena began making these sculptures: sitting at the dinner table, looking at discarded grape stems and some toothpicks scattered about, he picks them up and thinks....hmmm....then goes and gets a bottle of Elmer's glue and starts building. Eschatologist (First Version), 2013; toothpicks and glue; 4 1/4 x 4 3/4 x 4 in. Villa Aurelia (one), 2013; toothpicks, wood, and glue; 4 3/4 x 7 1/4 x 4 1/2 in. There is so much life and energy in these tiny works. Siena seems very at ease with their bursting structures. This type of form also shows up in his large bronze works, but for me what begins as an idea with fragility and the handmade as main components is ruined by casting into hard bronze. The bronzes held no interest at all for me. 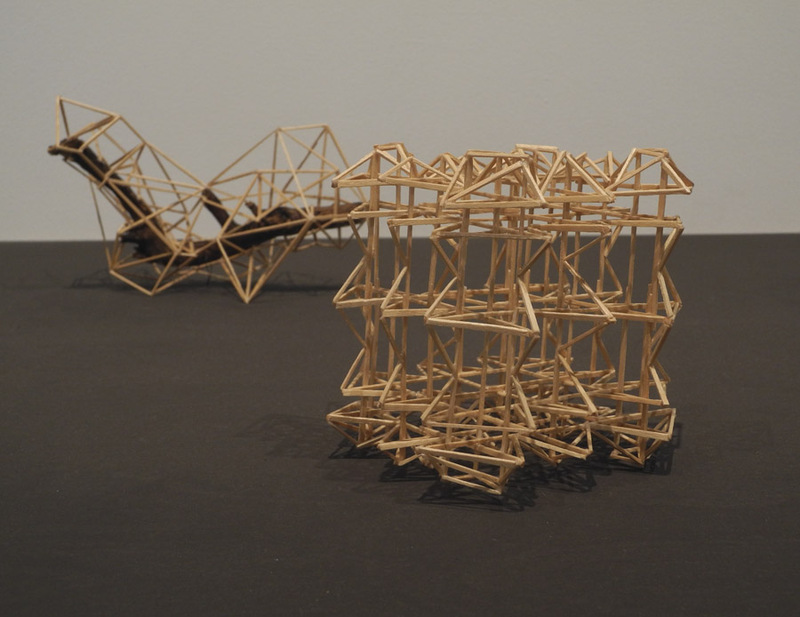 Richard Rand, 2014; bamboo, string, and glue; 12 x 16 1/4 x 12 in. 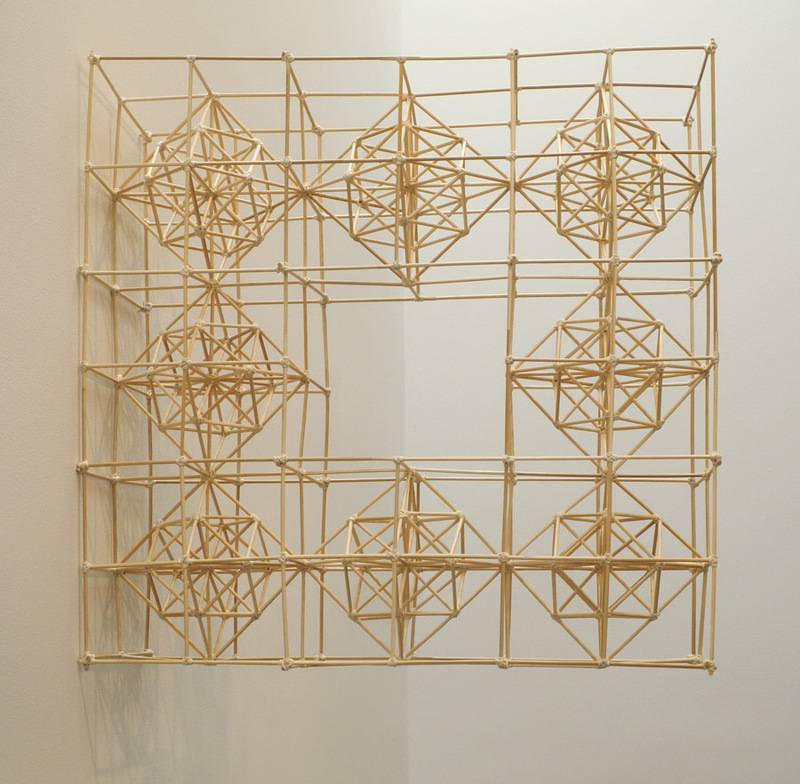 In Richard Rand, the spreading circles of string holding the bamboo together become almost decorative; they make us aware of the crisscrossing of line on this tilted grid. Seen from another angle, the sculpture is completely different: from seeing flat planes to being aware of the two long points that support the structure made of of three squares on its face. With his toothpick and bamboo sculpture, James Siena is finding wonderful new possibilities for the medium, and expanding his sensibility into new forms. so glad you like them, JBS. A New Painting: "Orange, Light and Shadow"
A New Textile: "Two Rectangles and a Trapezoid"
A New Painting: "Red Crossing"